Now I have said before that Corvettes are my favorite cars. I love the old ones. I love the current ones. So Chevrolet would have to screw up pretty bad before I decide that I wouldn’t like a new one. Luckily, that’s not the case. I can totally picture myself owning one of these sleek new Vettes. Of course, it’ll have to be 15-years-old with 210,000 miles on it to even begin to fit into my budget, but I digress. The point is; this is a cool car. Definitely different that what we’re used to, but cool all the same. With all that being said, let’s just go straight to the controversial part of this new design: the taillights. Gone are the four round lights that Corvette fans have grown to love, replaced by a more rectangular setup with Cleopatra-like black mascara vents. I can see why people are on the fence with this one. Maybe it’s because the Camaro already has rectangular taillights, and the Corvette should be too good to follow the Camaro. Maybe it’s just because those four round lights are so iconic. Whatever it is, this feature right here is going to take some getting used to. Another significant departure is the quarter window treatment. Corvettes have had a bubble hatch-type rear window since 1978. This is more of a Ferrari-like styling direction. To set this off, there are some brake cooling vents on the tops of the wide quarter panels. I haven’t really decided if I like this or not, but again, it’s not what we’re used to on a Corvette. None of these are deal-breakers to me, though. If you take in the full perspective of the new Corvette, this is one mean-looking machine. While the current car has a clean, familiar design, the ’14 version looks downright exotic. When people see one of these coming at them, I guarantee you that they are going to notice it. Improvements are everywhere, especially on the interior. Critics liked to mercilessly slam the old version because of the layout and materials of the cockpit. Some of that may have been justified, much of it wasn’t. But they’re going to have a hard time finding much wrong with this one. There’s an eight-inch touch screen, all kinds of real carbon fiber, and sporty leather everywhere. GM has been making great strides on their interiors across the board, and they don’t get much nicer than this. Under the hood, we’re looking at a new 6.2-liter V8. Called the LT1 (not to be confused with the one in my ’96 Impala SS), this state-of-the-art mill will churn out 450-hp and 450-lb/ft of torque. It will also feature cylinder deactivation for better fuel mileage, and an optional seven-speed manual (yes, I said “seven-speed manual”) transmission. The stage at COBO Hall in Detroit was like a mini-Corvette show in itself. They had two new Corvettes, a red one and a grey one, plus a red example that may have been a body shell hanging high on the wall. Surrounding the red one were samples from the other six generations of Corvette, all rendered in white. They were also all covered up before the show. It’s been a long time since Chevrolet pulled the tarp off of a ’66 Corvette 427 at a major auto show, so seeing that was pretty cool even without the hype of the new car. 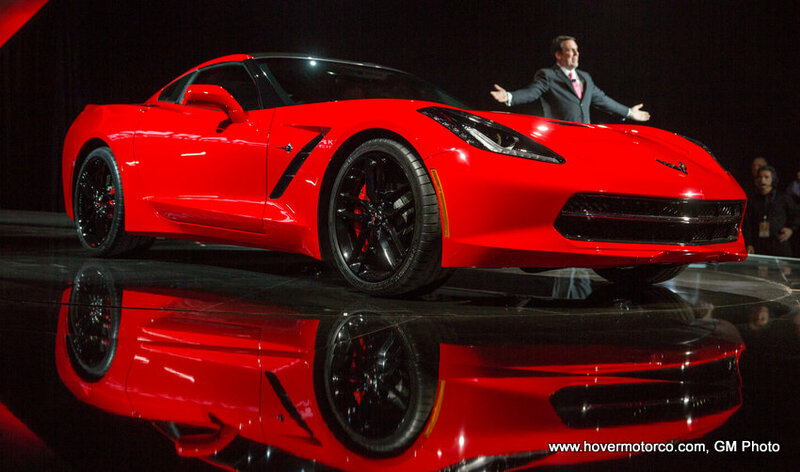 The opportunity to see a new Corvette introduction doesn’t come along very often, so I was pretty excited to be there as an automotive analyst with the Automobile Red Book. Naturally, I took a few pictures, which you can see in the slideshow below. Or, click on this link for a better version of the slideshow. Not all the people are 'on the fence'...this one is firmly on the 'hate it' side. The back end is atrocious. Side view 'meh' - Ferrari Maranello wannabe. Front - well we'll go with 'meh' on that one too. I personally don't like any of the fronts of new cars with their 'slanted headlights' and projector beams, so I'll just lump it in with the rest. Interior...ummm, not too bad except for that ridiculous screen. People cant drive anyway - do we really need to put a television in front of them? Especially in a car like this? Seriously. Hate to be such a 'negative nancy' , but it just hits me wrong all over. They'll sell everyone they can make! Well, they said they are going for a younger demographic, so maybe that's the reaction they were expecting from some people. All I know is that if you significantly change something as iconic as the Corvette, there will be some controversy. If you have a PS3 and GT5, you can download the car and drive it via the game system. It actually made it to the download area today (was supposed to be available yesterday). Craig, I enjoyed your article and pictures. I love this new Stingray! I'm glad Chevrolet "shook things up" on the C7. I've always liked and enjoyed Corvettes, but not enough to "pull the trigger" on purchasing one. But this new C7 is worthy! I'm definitely considering buying one. I've read articles that have said, "if you can buy a Corvette now, you'll be able to buy this one." So I'm anxious to see pricing and options available. I just wish we didn't have to wait until Fall to see them in the showrooms. Do it, Steven! If you buy one, you need to come by and give me a ride in it! Revoh, I'm hearing some minor rumors that the purists hated the tail lamps so much that Chevy is considering changing the rear a bit back to 4 round tail lamps? Sounds far fetched. I love the C7, what's not to love. "John" above sounds like a Grumpy Gus. I mean, I could see saying there were things about it you don't LOVE but to dislike it across the board is just insanity. This will, as always, be one of the best bang for the buck deals in automotive history. 'Grumpy Gus' may well be a fitting epithet in general; I am passionate about automobiles in general and Corvettes in particular. But if you'll read Craig's article, the 'on the fence' comment was about the rear end. That I hate. I cannot imagine anyone other than an 18 yr old that thinks a hyundai veloster is cool, actually liking it. In fact it looks like something hyundai or toyota would do. NOT Chevrolet on a Corvette. Looks like a japanese video game designer penned it. The rest of the car just leaves me cold - never said I hated the whole thing. It lacks 'Corvette DNA' visually imho. As stated, I'm sure it is an amazing vehicle dynamically, and significantly more reliable and cost effective than others in it's class. But if I had the money and wanted a new one [for that money I'll take a midyear or two all day every day] I'd be hustling down to the dealer and buying one now as opposed to waiting for this. I'm actually glad they shook things up! I'm almost 56 years old and I like the new look! The rear end IS entirely different-and that is NOT a bad thing! When I first saw the new C7 design, I said immediately, "that looks like a new Ferrari F12 Berlinetta". And that's not a bad thing either. Everything I've watched and read about this C7 says they wanted something new and revolutionary. They wanted to honor the past (with the Stingray name), but it had to be worthy of the Stingray name, yet pace setting too.